We are proud to introduce our range of fins coming from the Stand-UP Division of Select Hydrofoils. To do this, we knew we had to design and develop a dedicated range of high quality SUP fins using the finest materials and our CNC Machining Skills: This is how the SF Fins division was born! The goal is to strike the best balance between power and water flow with minimum drag whilst Paddling! Less experienced and recreational paddlers should opt for a large enough fin. The larger surface area enables riders to stay on course more easily, with an improved stability. When the Paddler has good ability, mastering the effective stroke of the paddle to minimise the 'row- row' effect (several dips of the paddle on the same side with minimal altering the direction), the size of the fin can be reduced to increase water flowing and handling. Skilled paddlers attain balance with less fin area to avoid drag and maximize speed. In Downwind SUP surfing, it is important to keep a good speed while paddling and surfing. We've been working on straighter fast fins, assisting with easy tracking and positioning on the waves. 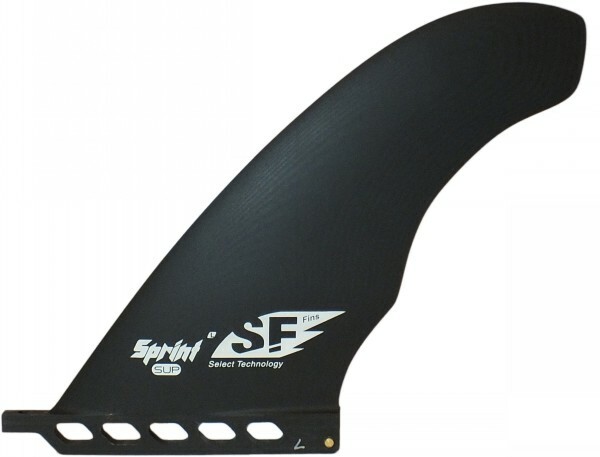 Sprint fins keep a curved leading edge to easily pass over potential obstacles/weed, helping the rider avoid stops and falls which can be so costly in and event, and frustrating for the recreational rider.